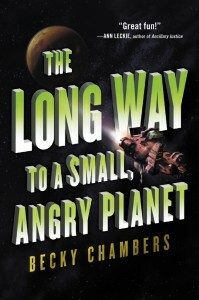 Via their blog, Harper Voyager announced today that Becky Chambers’ critically-acclaimed science fiction novel, The Long Way to a Small, Angry Planet will be coming to the United States this year. It was acquired by Kelly O’Connor, Assistant Editor at HarperCollins Publishers. Chambers initially self-published The Long Way after a successful Kickstarter campaign, and eventually saw the novel nominated for a Kitschie Award. After that, traditional publishers began to take notice. In addition to Voyager, Hodder & Stoughton is publishing Chambers’ novel in the UK. I’m disappointed to see Voyager re-using cover art assets from the self-published release, rather than following Hodder & Stoughton’s lead and producing a new, original cover for the book (I mean, check out the UK cover! Gorgeous! ), but a tight production schedule and (initial) digital-only release necessitate some concessions. Coinciding with Hodder & Stoughton’s hardcover release in the UK, Voyager will release a digital edition of The Long Way to a Small, Angry Planet on August 13th, just a few weeks from now, followed by a paperback release in Summer 2016.